A Most Ingenious Paradox: Matthews for Senate! I want to take a minute to publicly flog myself (figuratively speaking, of course!) for missing this tidbit over the holiday weekend: CHRIS MATTHEWS IS THINKING ABOUT RUNNING FOR SENATE IN PENNSYLVANIA! If I'd been on my game I would have run with this exciting and potentially hilarious news and posted an emergency Thanksgiving post. So, dear readers, I apologize if you had already heard about it, but I'm just catching up. Now, to be fair, Matthews has strongly denied that he is thinking about a run, much less hiring campaign staffers as fivethirtyeight initially reported on Friday. FiveThirtyEight's sources say different. Matthews's contract with MSNBC is up in June with no talk of renegotiations just yet, and why shouldn't he look forward to a 2010 run? He would be up against Arlen Specter, a 78 year old man (who will be 80 during the election) who has been in office since 1980. He is relatively moderate as Republicans go, and his Wiki page claims that he "has a higher approval rating among registered Democrats in Pennsylvania than Republicans (though the difference is within the margin of error)." So, what's my problem with this particular Republican that makes me wish him to be unseated by Mr. Matthews? Well - I don't really have one. But how much fun would it be to watch Chris Matthews campaign and talk about shivers up his leg and tingles down his spine and all the other sexual imagery you can think of in reference to politics, and while he's at it, the Philadelphia Phillies, while trying to get elected? Plus maybe he'd accidentally grab some more boobies on talk shows during the campaign, which would provide months of hilarity. 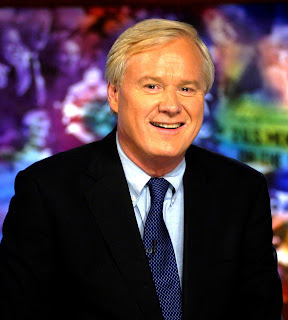 There's also the fact that I think Chris Matthews is a really good man with a really good heart. I would sincerely miss his show, which is far more entertaining and less self-important than Keith (but less witty and intellectual than Rachel), but I'm holding out hope for a Matthews campaign! I would just like to say that moments like this make me glad that I am still a PA resident! Yay for voting in the Keystone State--btw, do you have a read on whether Matthews is a Steelers or Eagles fan? This has huge implications. I mean, baseball is important and all, but football rules in PA.